Dr. Green is a political commentator, writer, and member of several conservative organizations. 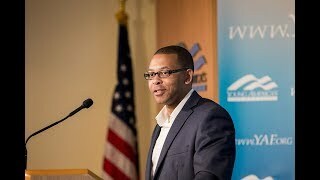 A member of Project 21 – a Leadership Network of Black Conservatives- and a contributor to the National Center for Public Policy Research, Derryck provides analysis on economic policy, the intersection between culture and race; pro-life issues including abortion and capital punishment; religion, immigration policy and politics in general. As a political commentator and writer, his work has been featured and citied in a number of media outlets, including Townhall.com, Spectator.org, MereOrthodxy.com, TheAmericanConservative.com, American Urban Radio Networks and several other media outlets across the country. Recently, during an interview conducted by CQ Researcher for an in-depth report about racial conflict affecting the country, Derryck accepted an invitation to share his thoughts in an opinion piece regarding Black Lives Matter in which he argued against the validity, credibility and agenda of the black activist organization. As faculty at Prager University, he wrote and appeared in a video entitled, “Who Are The Racists: Conservatives or Liberals?” where he debunked the myth of conservative racism. The video has been seen almost two million times across various social media outlets. He’s currently written two more courses for Prager University that he hopes to film before the end of the year. Derryck is also a staff writer for the Institute on Religion and Democracy, a faith-based organization that follows and comments on current political and religious issues affecting Christianity, culture and politics. Derryck received his doctorate in theology and ministry in May, and his dissertation will be published later this year. He’s also working on a second manuscript where he argues in favor of the social, moral and cultural benefits of blacks rejecting a collective, hyphenated racial identity and embracing racial neutrality and full social integration to become fully American.